How To Create Gap Year Affidavit In Minutes? The legend Nelson Mandela had once said that education is the most powerful weapon that can be used to change the world. And those famous words still ring true and shall continue to do so for time immemorial. The most beautiful part of any form of learning is that nobody can steal it from you. What you have learnt or imbibed in the form of education shall always remain with you even when everything else fades out. A person without the necessary education is hollow, he/she is like a structure without its basic essential foundation. What Is An Affidavit For Gap In Education? As the name suggests, an affidavit for gap in education lays down the reasons as to why there was a gap in your regular education. This gap needs to be uncalled for, and should not have occurred in the ordinary course of things. A gap year can also be understood as a gap or break taken from academics to pursue other things, for eg: a job, travelling, photography, pursuing any hobbies whatsoever or maybe taking a year or two off to prepare for entrance exams for admissions to prestigious colleges in the country. Well, there are also times when people have academic gaps because of financial constraints at home, which caused hindrance in pursuing studies. When Do You Need A Gap In Education Or Gap Year Affidavit? If you happen to be one of those who couldn’t, for reasons best known to you complete your regular education then you need to swear this affidavit. If any of your regular courses couldn’t be attended to or completed within the stipulated period of time then you will have to make this affidavit. You would require this affidavit if you have a gap in your academics say for eg: you took time off to prepare for competitive exams. Most universities ask for the gap in education affidavits if they receive applications from students who have a break in their studies and couldn’t finish their studies within the prescribed time frame. If you wish to take admissions into a college after a considerable break, you will have to submit this affidavit to the concerned authorities. What Is To Be Included In A Gap Year Affidavit ? An affirmation that the deponent is making true and authentic statements and everything stated is true to the best of his/her knowledge. How To Make The Gap Year Affidavit Legally Valid? Once you are done creating the affidavit, you have to get it printed on a Stamp Paper of the denomination suggested by the authorities concerned and also have to get it duly notarised by the notary public. We can also print this affidavit on a stamp paper and deliver this to your address. LegalDesk.com To Your Aid Again! Are you planning to create a gap in education affidavit and don’t know how and where to start or how to go about things? Well, friends don’t fret and panic as you have landed on the right page. 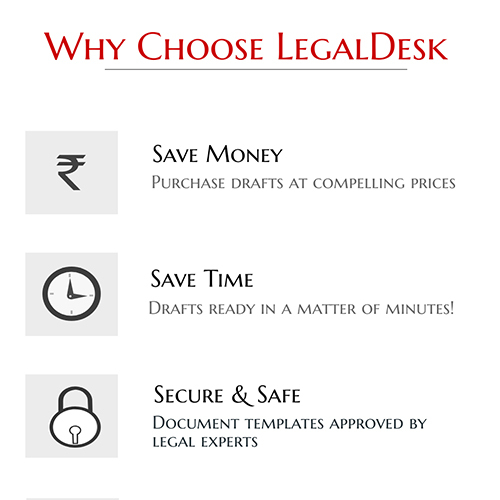 Legaldesk.com has today become synonymous with all things legal. Legal documents are now hassle free and a click away. Don’t wait anymore, just click, create and have us print your documents on Stamp paper and deliver it to your doorstep. And just in case you already have a format of your own, then we have a solution for that as well. Just upload the document on our site and we will be more than thrilled to print your document and get them shipped to the address of your choice. If you happen to be a budding startup like us or are planning to start one on your own and don’t know anything about the legal documents needed by startups, then, you can choose our Startup Packs and we will provide you a volley of legal startup documents and that too, at nominal prices.